Yes, the numbers/statistcs absolutely support everything you are saying Phil. The fact that Indies are popping up and surviving or are being acquired (Line by K2, probably no longer considered and Indy but they were) tells you a lot about the industry. I guess any iindsutry where the majority of the particpants are mediocre at best is always ripe for innovation at the equipment level. Golf was stagnant for years until Calloway came a long with the Big Bertha lines and to some degree the meteoric rise in golf WorldWide has been driven by the advances in equipment. The fact that more people can actually get into steep powder and make it down without wiping out multiple times has to be a good thing for the industry. This terrain for years was the domain of the elite. I still beleive that quality instruction will take people further than a rockered ski, but it requires work, focus and patience. Unfortunately quality instruction is not available everywhere!! 150 and counting replies to your thread. Topic of the year! I hope to see the Gandolf's in action! Why thanks. It would be longer except I broke out the Dodge boots thinking people had more they wanted to discuss.? However, while I too am amazed at the legs this thread has shown, I must demur and remind everyone that JBotti was the power "behind the scenes" of this thread. Go back and review, look at the numerous posts where he challenges my competitive nature saying things like "I'm pretty sure that I'll be buying first, but if you buy a pair let us know."? How shrewd. Challenges to my manhood as he reminds me that "it takes more effort to get it up (on edge) with wide skis". What a challenge to a 62 year old grandfather. And more subtle messages, such as "you can buy any ski you want Jim, even if you can't afford it".? Now we know what effect that would have on most guys and their toys.? And so, in summary, I would like to say Thank You to one and all for all the fun this has been and continues to be. I am very pleased with the selection and with the interaction with SkiLogik in getting them somewhat customized for me. I like the idea of having a fairly limited production ski, one that all who have seen them seem to agree are pretty gorgeous that also (I believe) fit well with how I plan to use them. And its all JOHN's FAULT. And he's been pretty quiet, but I'm expecting Perry to buy a pair too. Dave at Ski Logik I'm sure has a very different view. If he read this thread he would say 150+ posts and counting and I have only sold one pair of skis!! It is nice that a ski can get a few people so excited. It definitely helps pass the time while we wait for some snow!! He may not have the order yet, but Peter is going to buy a pair, Perry is going to buy a pair, and you are going to buy a pair. And Ron will probably surprise us and buy a pair of Howitzers with the Indian Pipe graphics just to hang on his wall? And I took Mariella's comment about "we are very busy" to be a good thing from their point of view, even somewhat surprised. You know, Rome was started when someone laid a single brick?? Actually, Dave ought to give us our skis for free as marketing. I don't know if he had even heard of RealSkiers until we started talking to him, and I sent him the information about the Ski of the Year selection after Peter made it.? And SkiLogik ahs done a pretty good job of distributing that and the FreeSkier selection -- I was very surprised to see it on CNBC and Forbes. And Peter got some free advertising out of it as well, since SkiLogik is referencing RealSkiers as an authoritative ski reviewer. And on a infrequent serious note, John, thanks for getting this whole ball rolling. I'm very excited.? It's unusual for me to be willing to pay list price, but the confluence of events was karma. No, he would probably say "How can a bunch of guys argue/discuss how to make turns so much."? They need to just get out and do it. 150 and counting replies to your thread. Topic of the year!? I hope to see the Gandalf's? in action! I decided to check, so clicked on the Column heading "Replies" so that the system would sort by number of replies. The topic on this "SKI forum" with the most activity is titled "Coffee, French Press, and Espresso"? ? ? If you want to have a thread about a breakthrough product. Start a thread about the Dodge ski boot. This evolution is as important as the evolution from leather to plastic. I already did (I think at your suggestion after Todd posted something).? It's at the top of the list under "Boots and Boot Fitting". No howitzer for me... if Start haus doesn't sell it, I am prohibited from buying it! On th edodge boots, I posted an article I found on them. These are going to be huge. I had forgotten about the big weight difference. Just imagine skiing with a lot less weight in your boots and having the same or actually improved performance!! We could all ski longer and better and be less tired!! replied over there. As far as weight, have you lifted a WC Slalom or GS ski? I will get into a pair of Dodges to try as soon as we have another demo. We had 6-7 early prototypes at the shop and the boot IS amasing. To look at it you would never think the boot could do what it does. It is the Catterham 7 of boots. OK, now I AM impressed by your car knowledge.? ? I have been somewhat impressed by your (accurate in my limited opinion) ability to discriminate between Porche models and some other car examples to describe differences between skis, but pulling out the 7 shows a real depth of knowledge (again in my opinion).? I've heard and read of the Caterham but never would have been able to pull the name out of the air as a reference (I would probably have hearkened back to the early 260/289 Cobras compared to the competition of the day). Hi everyone, thought I would solicit some advice. 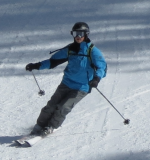 I have skiied california for 15 years, and am in the new school crowd that just skis wide. I like it much better for just about all conditions. This year i am moving my skiing base to vail though. I had 08 Gotamas, but lost them in an unfortunate accident last year. So I need replacements. I loved those gotamas, but tried the newer (rocker) ones and didn't like them as much for all mountain. I'm not quite sure how to describe my skiing--i always go looking for off piste steeps. BUt I also like wide skis on groomers. No tired knees here. I take them long and fast with the my knees together. I think I don't angle them, just change their direction. I read these reviews and think these skis sound great...i guess i should wait and try to demo them, but i F'in dislike demoing skis. Was it an unfortunate smelting accident?